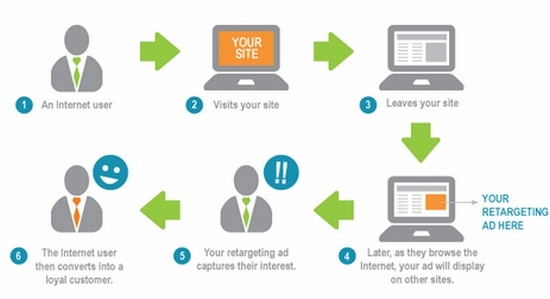 Even if you have dont know what retargeting is its quite likely that you have experienced it. Retargeting is where a person visits your site, leaves (often without making a purchase) and then sees an ad for your site or product on a different website that they later visit. Have you ever looked at a product on Amazon, Ebay or the Walmart website and then a day or two later noticed that your being shown ads on Facebook for similar (or the same) product? Its almost as if Facebook somehow magically knew that you where interested in these types of products. Well the truth is that they did know though there is nothing magical about it. Let me explain. The most common platform for retargeting is Facebook retargeting. The reason is simple. In order for retargeting to work you first have to have a person visit your site or page, you then have to use a special retargeting pixel to capture that visitor, finally when a visitor visits the page you are retargeting on it uses uses the data captured from the retargeting pixel to display your ad to your site visitor. In order for the whole thing to work you need to be running retargeting ads on a site that your visitor is likely to go to. With over 1 billion active users its very likely that anyone who visits your site will eventually visit Facebook afterwards. This makes Facebook an ideal place to put your retargeting ads. Ok so now we know how retargeting on Facebook works the question is does it work? The answer is 100% for sure they do. There is a reason why big name companys like Amazon use them. Because they increase sales. Period. But there is actually two ways to use retargeting. The first is if you are selling something. You use retargeting to show users who did not buy your product ads in the hope that they will eventually buy it. This works because its well known that many people need to see an ad for a product multiple times before they buy. In fact many people need to see an ad between 5 and 7 times before they decide to make a purchase. Also by having your ad show in multiple locations gives you brand recognition and creditability. Both of which are make it more likely that the potential customer will make a purchase. The second way is to use retargeting ask kind of a ‘second list’. This way is most useful for the affiliate marketer. With affiliate marketing you build up a email list of people interested in your niche and then mail them affiliate offers (that simplified of course). The difficult part of this though is of course building up the list. You have to convince people to give people your email address. These days that’s no small feat. However with retargeting all you need to do is get people to visit your website or web page. 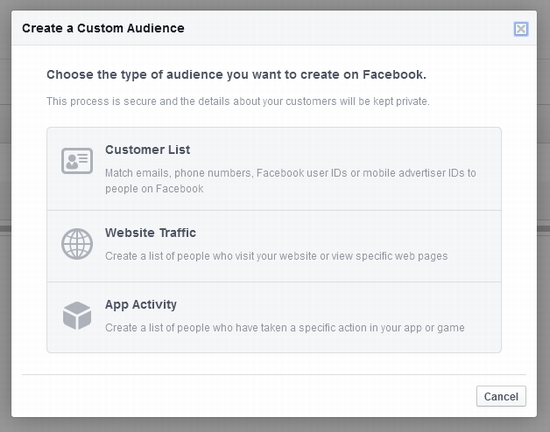 Once they do they are added to your custom audience and can be used for Facebook retargeting. You can then run ads for niche related products to this custom audience knowing that the users are interested in this nice. Basically your custom audience becomes a sort of ‘second list’ that you can advertise your affiliate products to at will. What makes this attractive is that this ‘second list’ did not have to opt in. They got added just by visiting your site once. Even better is that if you run relevant niche related ads you can get clicks to your ad at a very low cost, which makes it fairly easy to make a nice profit on a good converting affiliate offer. As a real world example let me show you some results from two ads campaigns that I ran on Facebook. This first ad was ran to an audience I created based on user interests. I selected the locations I wanted to show the ad to (United States, United Kingdom, Australia, New Zealand) and the interests I wanted, which where related to internet marketing. This ad was for a free internet marketing software. Look at the results. Quite bad. The ad was shown to over 5000 people yet only 14 clicked the ad. Because of the low Relevance Score and poor performance I ended up spending a very high $1.25 per engagement (click). Its very hard to make a profit with results like this. The difference is nothing short of astounding. Even though both ads had the same budget the second ad had a much higher conversion rate. In fact it was about 15 times higher. It had a Relevancy Score of 8 out of 10 which resulted in me paying only 18 cents per post engagement. Even better I got 170 clicks from this ad! Those 170 clicks all went to my review, filtered down to the product I was promoting and got me a return on my ad budget of about 300%! Why the difference? Because the second ad was a retargeting ad. I was showing the ad to people I knew for sure where interested in the niche I was promoting because they had visited web pages related to that niche. While the second ad was shown to less people those people where laser targeted which resulted in a much better interaction of my ad. Ok so how can you get started with Facebook retargeting? First you are going to need to a way to put your Facebook retargeting pixel in your site or web page. If you use WordPress there are plugins that you can use which will add it to your site for you. If you dont use WordPress you will need to be able to add the HTML code to your sites code. In order to get your Facebook retargeting pixel first log into your Facebook ads account. Click the little down arrow icon next to your name in the upper right hand corner of Facebooks website and select “Manage Ads”. For some reason if you have not yet created your first ad on Facebook they wont let you access the ad manager. This is no problem though, just create an ad, and then delete it. Once you have made at least one ad you will be able to access the ad manager. Select “Audiences” from the menu on the left hand side of the ad manager. Click the green “Create Audience” button on the upper right and select “Custom Audience”. You will then be asked what kind of custom audience you want to create. Select the second choice “Website Traffic”. From here you will be able to give your custom audience a name. Select if you want to target your entire site (normally this is what you would choose) or just a specific page on your site. 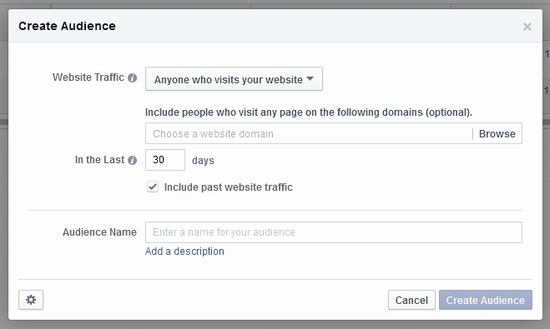 You will also be able to select how long people will remain in your custom audience after visiting your web page (I prefer 90 days not the default 30) and you can also get your Facebook retargeting pixel code by clicking on the gear icon in the lower left. Now its just a matter of adding your pixel code to your website and whenever someone visits your site they will be then added to your custom audience. As long as you run ads that are related to the same niche as your website you will get an improved Relevancy Score, higher click through rate (CTR) and low per click cost. In short your ad will perform better. To close I just want to remind everyone that while retargeting is great for people who sell a product of their own its also great for the affiliate marketer. With retargeting you can show people ads for affiliate offers provided that the offer is related to the same niche as your website. A lot of people thing of e-mail marketing when they think of affilaite marketing. But the truth is that e-mail marketing is only a small part of it. With retargeting and PPC ad marketing you can get low cost clicks to your offers that will make it fairly easy to get a worth while return on your ad investment. Get Bretts retargeting plugin 100% for free. Enter your email address below to download instantly! Hi Brett, thanks so much for sharing this as this is something I have been meaning to do for a while now. I am interested in using this for both affiliate marketing and products I release in the IM space. Do you have any tips on the actual design of the the ads? As far as images and copy. For your affiliate product ads does the ad copy say it’s a review or bonus or would you advise a different angle? For the ad image, just use an eye catching graphic and avoid much text. Im not sure I understand the first part of your question, there are several different ways to make an ad with Facebook, I did not cover that because this is a tutorial on retargeting, not on Facebook ads (though I can do a Facebook add tutorial). My personal favorite way to make an ad though is just to have a fan page, post a link to my target URL to the fan page, and then boost the post. When you boost the post, you can select to show the ad to the custom audience you created. 2.i saw several tool about retargeting from developer seller Sam Baker do we really need to buy those? 1) Sounds like Facebook is being buggy for you. You can get your pixel code after creating your audience though. After creating your custom audience just click the check box next to the audience, and select “View Pixel” from the actions drop down. 2) Of course I cant comment intelligently on some unnamed product by Sam Baker .. I dont use anything but the WP plugin I wrote. 3) If you select to capture people who visit your site then they will be all together. If you select people who visit a specific page you can enter a specific website URL and it will only count people who visit that website. I am not sure what products I can utilize as I am with a Direct Sales company – Plexus Slim and the company already has us use their site. I bought my name to shorten the website and direct it back to the company provided website. I want to build my business with new customers and build my team. What software, tools do you suggest? Im sorry I dont know about what your doing. Sounds like you are doing something that is out of my area of expertise. Great Information… helped me to set up my first Facebook retargeting. Although, the layout has seemed to change since you posted this. – You click on the Tools tab up top, and then Audiences from the drop-down box. I believe you can get to your custom audience both ways. Hi Brett, thanks for this relevant information on Facebook Retargeting. And thanks for the continued tutorial on various aspects of IM know-how. I think it shows how honest you are about helping people make money. This is very important to some of us who still struggle to understand the IM atmosphere, and also help us resolve the confusion that is brought about by information overload. Thanks again, not only for the tutorial but also for the relevant products that you put out. May I know where did you gather the 2nd set of audience (I.e targeted audience)? R they ur website visitors? Yes that is correct. I retarget my website visitors. Also when I sell a product I retarget people who visit my sales pages. I would like to run fb ads for my local business. This is a good course that also covers FB ads, but the launch special pricing is over and its a bit expensive now. Thanks. Does the course covers retargeting. And would like your advise if there is any tools/course to set up my company website from scratch. What course are you talking about exactly? “advice setting up a company website from scratch” is so general I cant even hope to answer that. Its like saying I want an advice on painting. Currently my company do not have a website. I notice that there are a few website builder like wix, weebly godaddy etc.Or do we use Word Press to build the company website. Yes Google.com “how to setup a WordPress site”. Does the Facebook retargeting pixel thingy only work for Facebook? Anyone that gets retargeted from somewhere I have my retargeting pixel thingy, gets shown MY facebook ad while they are on FACEBOOK? How does this work for other sites, or Google? Is Facebook the only way to retarget someone with ads? or is there other places / ways to do this? I’ve tried FB Ads in the past, but it was almost impossible to get any IM/MMO related Ads approved. Any tips to get these ads approved? Its quite easy, I do it all the time. Read their guidelines and follow them, they are quite clear.